Too many people forget about the amazing storage potential available in their garages. Offering approximately 400 square feet of floor space, the average garage can be optimized to hold an astounding amount of stuff. 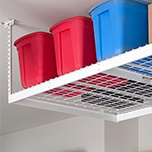 Whether that “stuff” is sporting equipment, tools, extra wood and other building supplies, chemicals, gardening tools, craft materials, toys, or a bit of everything, My Custom Garages can build you the storage solution that you have been searching for. 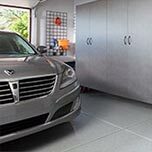 Every garage built by My Custom Garages is designed with your specifications in mind. 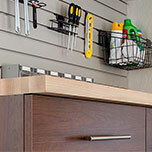 You won’t end up with a humdrum garage storage solution: It will be customized for you! Because My Custom Garages value you as a client, we would appreciate your feedback by leaving a rating on our FaceBook page. If you are ready to say goodbye to garage clutter and hello to a newly organized, beautifully designed garage, then look no further than My Custom Garages. We offer everything to make your garage into the storage space of your dreams, from overhead storage, to garage shelving, garage cabinets, workbenches, and epoxy garage flooring. Give us a call today to schedule your free, in-home consultation. You’re under no obligation to buy; we want to show you what a tremendous difference a custom garage organization system can make in your home.